It's only been ten years? Where has all of the time gone? When RuneScape came out in January of 2001, the world was a different place. There were no such thing as Xboxes, normal gamers didn't care about the number of cores on a processor, and the World Trade Center Towers dominated the Lower Manhattan skyline. Over the last ten years, RuneScape remains one of the relatively few things that hasn't undergone any drastic changes. Among RuneScape's 140 million uniques, the dedicated users who've stuck with it for the better part of a decade have done so because the mechanics are solid, they can hang out with their friends, and it's free of charge. Well, free-ish. Many subscribers pay UK developer Jagex around 8 bucks a month for premium content, like extra quests and last month's giant flying custom castles. Yes, giant flying custom castles. To be more specific... citadels. Each of the games clans, which just went live in April, now has a floating castle which they can customize as they see fit using an elaborate editor (pictured below). 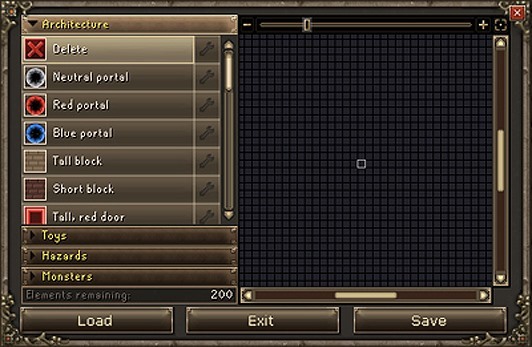 For those who like slicing more than interior design, there's also an option now to build custom game scenarios using a similarly robust editor, sort of like the one in Neverwinter Nights. Of course, both features are only open to paid subscribers at this time, but the results are pretty impressive. And these types of new features, ones that allow players to customize their experience, are crucial for keeping players hooked on a game for decades. For a game with terrible graphics that plays roughly the same way since its release ten years ago, you'd think it would have died long before. But it's still kicking. Reportedly, RuneScape has attracted 1.3 million new users since it added clans in April. Any normal indie game developer would be thrilled with those numbers, but Jagex is different. They have 450 worldwide employees, a staggering number for an independent company that mostly works on one game. That many employees require a lot of monthly paid subscribers (plus some more from their FunOrb casual game portal) to support it, but apparently Jagex makes it work or they wouldn't still be doing it. They were one of the first companies to implement a freemium system for a major game and are an enduring testament to how much money one can generate. Wow that's amazing, I didn't even know that many people still played that game.